DownWithTyranny! : Democratic House Campaigns About The DCCC Regional Vice Chairs: "What's That?" Democratic House Campaigns About The DCCC Regional Vice Chairs: "What's That?" What a waste of time this morning! I called a couple of dozen campaign managers all over the country, almost entirely campaign managers for candidates who had already won their primaries. And I had an identical simple question for each one: "Have you talked to your DCCC Regional Vice Chair?" Except for the ones in California, I got the same answer from every campaign manager. "Who's that?" or "What's that?" No one knew. They didn't know on the East Coast. They didn't know in the Midwest. They didn't know in the South. The region that encompasses Texas and the Rocky Mountain States doesn't even have a DCCC vice chair because Pelosi and Luján preferred to control everything themselves so never bothered replacing Jared Polis when he resigned about a year ago. The West Coast campaign managers and candidates had a different answer but they all had the same answer among themselves, more or less. They couldn't stop singing the praises of Ted Lieu and of his chief of staff, Marc Cevasco. Why's that? Simple. Ted had just done the first of 5 events he planned featuring all the candidates. At each event, all the money raised-- and all means all gets split up between the candidates. Ted gets zero, except the satisfaction of helping elect Democrats who have already won their primaries. At the first event, Ted brought in $520,000 and he hopes to do similarly well in Orange County, San Francisco, Seattle and at another one in L.A. All the California candidates had an opportunity to be introduced and then mingle with the 250 high end donors. One campaign manager told me it was the best event she had been part of ever, although she did admit she's a massive Fleetwood Mac fan... and Lindsey Buckingham was the "entertainment." Another manager was flipping out because one of the guest s was Michael Avenatti, who he got to talk to one on one. It sure would be nice seeing the other regional vice chairs taking their positions seriously and not just as another box to tick off on their resumes. I called one of them and he told me he doesn't know why he ever ran for the post and doesn't know what he's supposed to do. Nice! Of course it doesn't help that Pelosi and Luján want to see these guys fail so they can reassert and concentrate their own authority over the DCCC. The other thing I like about the way Ted is doing this, is that the money goes straight to the candidates. They know how to spend it and they-- or most of them-- are the least likely to waste it on consultants and wasteful media campaigns. When you give money to the DCCC, a huge portion is money right down a rat-hole. I'd like to see some of the congressmembers involved with the DCCC raising some real money for candidates, not just for the hopelessly corrupt organization itself. Denny Heck (D-WA) was the chairman of the failed recruitment committee. The least he could do is raise some money for the lousy candidates he recruited. He's personally very wealthy and has lots of wealthy friends. Spread the wealth and let's stop Trump in his tracks for real. The "Sucking Up To Rich People Committee" is co-chaired by Jim Himes (D-CT), Richard Neal (D-MA), Terri Sewell (D-AL) and Joaquin Castro (D-TX). How about diverting some of those partners and allies cash into the candidates' campaigns, instead of watching the crooked DCCC staffers waste it making incompetent consultants wealthier? Alright, as long as you've gotten this far, you deserve some good news. 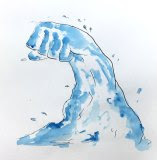 Bloomberg reporter Josh Green wrote that the blue wave is being powered by a green wave. 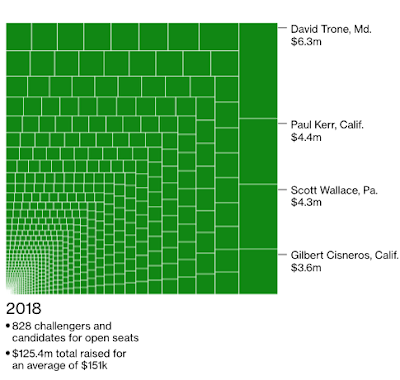 In the second quarter that ended June 30, "the torrent of money pouring into Democratic campaign coffers helped 73 House candidates outraise Republican incumbents and opponents in races for open seats." Since Trump’s election, Democratic enthusiasm has been apparent in all sorts of ways: the proliferation of anti-Trump marches, the record number of new candidates running for office, increased turnout in primaries and special elections, and surveys showing left-leaning voters more invested in November’s election than their counterparts. That energy has also translated into dollars. In the second quarter of this year, non-incumbent Democratic House candidates raised more than three times the amount they did in the same period in 2014. That works out to an average of $151,000 per candidate, compared with $101,000 in 2014. Oops-- bad chart. These numbers should actually be taken out of the averages since these are super wealthy self-funders. None of this has anything to do with grassroots enthusiasm or anything... except obsessed guys buying House seats. This is how much each had contributed to his own campaign as of June 30. The percentage is how much the self-funding equalled in relation to total fundraising. I can't go on with this. I read the rest of Green's report and realized my goldfish knows more about American politics than he does and that all his "info" came straight from the DCCC press shop. Let's just leave it at this and remember, it's the anti-red wave that will be lifting all boats in Novmeber. Only the Kremlin could save the GOP now. Will Trump get Putin to do it again? You know there's a special congressional election on Tuesday, right? Pat Tiberi retired and this is to replace him in central Ohio's super-gerrymandered 12th CD. Most of the voters live in north Columbus and the suburbs and small towns north of the city. It shoots north of the Columbus Metro as far north as Bellville and Mansfield rand as far east as as Newark and Zanesville. The last time the district voted for a Democratic presidential candidate was 1916 and the PVI is R+7. Obama lost with around 44% each time and Trump beat Hillary 53.2% to 41.9%. Democratic congressional candidates don't try to win the district but this special election is... special-- TRUMP. The Democratic candidate is a conservative Democrat, Danny O'Connor (think Ossoff) and the Republican is an establishment guy, Troy Balderson, not a Trumpist crazy. But Pence has been campaigning for him and Trump will be there over the weekend. Monmouth reported a dead heat this week-- a one-point difference, which means it's going to be all about which field operation will turn out the most voters. As of July 18, O'Connor had raised $1,445,504 and had $129,201 in cash left and Balderson had raised $1,264,723 and has $208,032. But the GOP is spending like mad on Balderson's behalf. Paul Ryan's PAC spent $2,460,624, the NRCC spent $1,302,427 and the RNC kicked in $451,925. Other right-wing groups tossed in another million. Meanwhile, the DCCC spent $629,854. In all, $3,171,265 has been spent smearing O'Connor, basically trying to make him into Nancy Pelosi and $2,003,753 has been spent trying to bolster Balderson. If the Democrats win Tuesday, it means the only issue in November will be Trump and that the GOP might as well let the chips fall where they do and save their 2018 money for 2020. And this is the Party that too many still believe can be taken over from within.